Six months ago, I set a few goals on this little blog of mine. Thank goodness one of those goals wasn't to blog more often because that would have been an incredible failure. 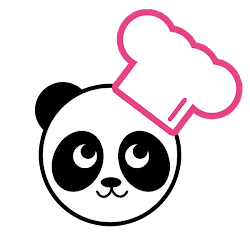 Instead, I have actually cooked and baked a number of recipes from a few new cookbooks and even experimented with some non-wheat flours. I have only made bread a handful of times, but it’s only halfway through the year right? So what else has been going on? In February, I started studying for the Professional Engineering exam, which I took in April. Earlier this month, I found out I passed! I haven’t framed my certificate yet, but I added P.E. to my email signature and got new business cards! It’s official now! Anything else? Oh yes. Something big. And exciting. And amazing. Dan and I have spent the last six months on cloud nine knowing that come October our little family of two will become three as we welcome a baby son! I am 26 weeks along and can feel our little man wiggling around more every day. Over the next three months, we are looking forward to nursery decorations, new furniture and curtains, car seats and play yards. And adorable tiny socks. I am planning to post a few nursery updates here along the way as the room comes together. More than anything, I am so excited to meet the little guy in the fall! As far as kitchen escapades, there have been quite a few highlights. I made cranberry quinoa scones from Small Plates, Sweet Treats by Aran Goyoaga after picking up a variety of gluten-free flours from Sorgel’s market. I made my first prime rib roast for my father-in-law’s birthday and tried my hand at smoked barbeque ribs (both from Carnivore by Michael Symon). The spice rub on the ribs was fantastic and I plan to keep a little jar of it on standby in the spice rack. During Easter weekend, we shared our exciting news with our families. To celebrate the occasion, I made osso buco (another first for me) from Michael Symon’s first book, Live to Cook. I paired it with traditional risotto Milanese and it was so yummy. And then there was ice cream. 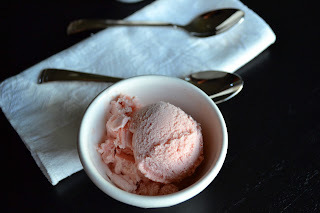 The baby and I have been indulging in plenty of ice cream and frozen yogurt lately, and I have churned up a couple of delicious batches at home. 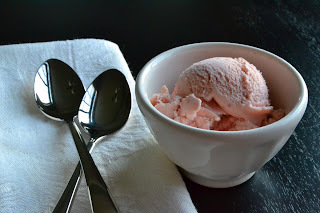 A couple of months ago, I made crème fraiche ice cream (from David Lebovitz’s The Perfect Scoop) and I absolutely loved it. If you like the creamy tang of crème fraiche (or sour cream), you would love this ice cream too. It didn't do Dan any favors, but that only meant there was more for me (and my growing little peanut). Finally, with the arrival of summer and the CSA season, we have had a fresh basket of ripe, juicy, and delicious strawberries every week now for the last month or so. Yet, when seasonal strawberries popped up on sale in the grocery store a few weeks ago, I couldn't resist picking up a few to add to the bounty. I decided to make a batch of strawberry ice cream and was not disappointed. As I mixed up the custard base, I roasted the strawberries in the oven, which concentrated their flavor and rendered out some of the moisture. After a quick puree in the blender, I added the strawberries to the sweet cream base and had some delicious ice cream in under an hour. What other ice cream flavors should I try out this summer? Heat the half and half and sugar in a medium saucepan. Pour the heavy cream into a large bowl and set a mesh strainer over the top. In a separate medium bowl, whisk the egg yolks. Slowly pour the warm half and half mixture into the egg yolks while whisking continuously. Return the mixture to the saucepan. Stir the mixture continuously over medium heat, scraping the bottom of the pan while stirring. Continue heating the mixture until it thickens and coats the spatula. Pour the custard through the strainer into the heavy cream. Add the strawberry puree and lemon juice and stir to combine completely. Chill this mixture thoroughly, either in the fridge or over an ice bath. 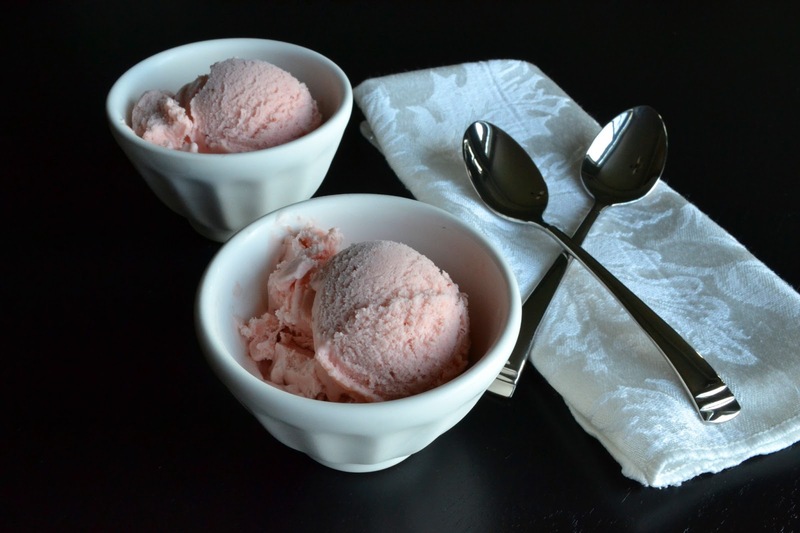 Once chilled, freeze the ice cream in an ice cream maker according to the manufacturer’s instructions. *To make the roasted strawberry puree, hull and quarter 1½ pounds of fresh strawberries. Place on a sheet pan lined with parchment paper and roast in a 350 degree oven for approximately 15 minutes. Puree the roasted strawberries in a blender, food processor, or food mill and chill until needed. I love homemade icecream and strawberry is my favorite flavor. This recipe looks really interesting as I’ve never heard about roasting strawberries before. Thanks for posting.